Fit Foodie Megha: Chandraseniya Kayastha Prabhu (CKP) Cuisine revealed - The Secret Chulha Pop Up! – Reviewed! 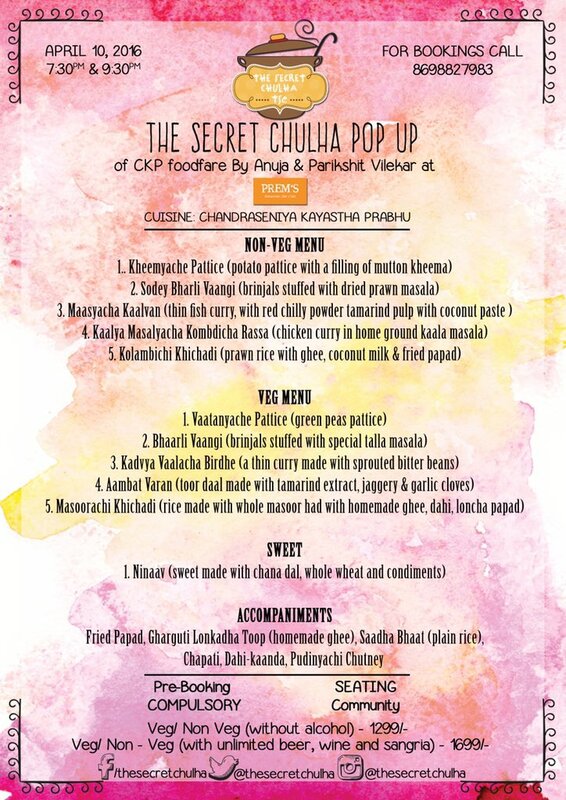 Chandraseniya Kayastha Prabhu (CKP) Cuisine revealed - The Secret Chulha Pop Up! – Reviewed! Chandraseniya Kayastha Prabhu (CKP) is a sub caste of Kshatriya and a part of Kayastha community and an ethno religious clan of South Asia. The origin of CKPs is from Kashimir and North India. Some of them settled along the Konkan coast hence fish, kokum, tamarind have become an integral part of its cuisine. CKPs cuisine is influenced by Maharashtrain style of cooking but still distinctive from sub ethnic groups. Few ingredients which sets them apart are Kadve Vaal (Bitter Beans), Sodey (dried prawns),Sukat (dried shrimps), Roomali vadi ,Vadiche sambar, Khajacha kaanavla etc, Bharla Paplet /Saranga (Stuffed Pomfret), Prawn/ Sode Chutney, Masyache Kaalvan (Fish Curry) Tallya Masalyache Mutton/ Chicken while some sweet items like Tel Poli and Ninaav needs a lot of skill and time, thus made once in a year. We rarely get to hear and eat hidden cuisines like these and I am so glad The Secret Chulha is there to unlock the secrets of sacred dishes that have been out of our reach. They are a platform of giving the recognition to the grandmom's dying dishes. The Secret Chulha is a monthly event to bring interesting, exciting and uncommon cuisines to all food lovers along with the experience of the culture it belongs to. This month The Secret Chulha Pop Up was by Anuja and Parikshit Vilekar at Prem's. They do the home catering—Cloves Catering. I was really excited to be a part to tasting Chandraseniya Kayastha Prabhu (CKP) cuisine. Vatanyache Pattice was first served to us with tangy mint chutney. Vatana or Peas were cased in mashed potatoes and deep fried till crunchy. Totally loved it! Highly recommended! Bharli Vaaangi CKPs usually stuff the Brinjals, slit to the middle, with a masala which has chopped onion, crushed groundnuts & Tarla Masala plus a range of spices and condiments. Oh my..you won't get this flavour normally. Super delectable! Kadvya Vaalache Bhirde is typically a curry, much loved amongst CKPs, made with legumes like Bitter Beans, Mung Beans, Brown Gram etc. The Bitter Beans, in this case, are soaked for a day, then left in a warm place to sprout for another day, immersed in warm water the third day to help remove the cover & then cooked with a hint of Kokum, red chilly powder, jaggery & fresh coconut paste; tasted best when had with either Chapati or Plain Rice with a dollop of home-made ghee on top. Wow..the rich aroma and flavours lingers in your mouth for long. Aambat Varan is Cooked and mashed Tovar Daal boiled with proportionate quantity of water, tamarind and jaggery and then tempered with crushed garlic cloves to give it a nice garlicy flavor which compliments the sweet and sour taste of Jaggery and Tamarind. Nice, tangy preparation. Masoorachi Khichadi tastes best with spoonful of home-made Tup, a piece of fried papad, some pickle and a little bit of Coconut Milk. All three made a great combo. I could have eaten this only for my dinner, if I had not hogged my fav. pattice. Also, next pop up is on 1st May 2016, Sunday. Bihari cuisine by Chef Swati Singh who lives in London and holds her pop up there and in India one can visit her pop-up by The Secret Chulha at the Prem's, Koregaon Park, Pune. Menu includes, Litti chokha, Bihari style mutton, Aalu kathahal (potato and jackfruit) curry, dal pitha (Bihari Momos) among other items. Do visit and share your experiences in the comment section below.